As I continue my foraging across the Île-de-France in search of free fruit, which so far has included wild plums and elderberries, I finally chanced upon medlars. One of the goofiest fruits I’ve ever come across, they’re a member of the rose family and are prepared similar to rose hips, or backside-scratchers, which doesn’t make me want to eat them. And my trusty fruit-searching sidekick made a snide remark about their bilious taste. I think the fruit gets a lot of derision because I’ve been told that in England, they’re referred to as dog’s backsides. (No comment about English humor…although I did read that the French call it cul de chien.) However, I am nothing if not a man of great class and distinction, and I can’t resist free fruit – no matter what it’s called – so I decided to pick a bucket of them and make medlar jelly. 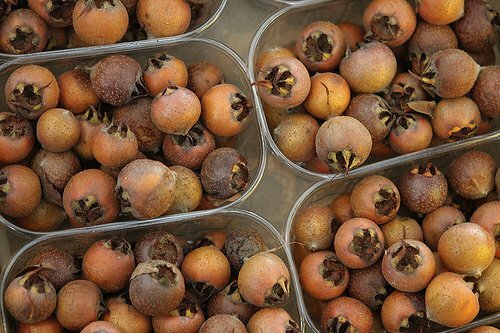 Although I’ve seen them for sale once in a market in Paris, I don’t think medlars aren’t really all that popular. For one thing, they share the same name as loquats – nèfles. And if you’ve ever lived near someone with a loquat tree, you are probably familiar with people begging you to take some off their hands or leaving bags on your doorstep, and running. And, frankly, I don’t know too many people in Paris who make their own jam. Which works out great for me because I give out homemade jam for holiday gifts. And I’m already starting on this year’s gift list with my medlars. I used recipes by British cooks, Jamie Oliver, Nigel Slater, and Hugh Fearnley-Whittingstall for guidance because I didn’t know much about medlars. 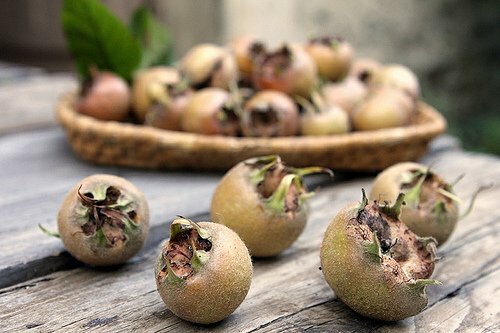 But the first thing you need to know is that medlars need to be bletted, or left to soften and “rot” to a rusty-brown color. Romain had something made from medlars that he said was absolutely awful because the person preparing them hadn’t bletted the fruits. So if you’ve ever bitten into a raw quince, you can imagine how someone might not be so inclined to give the fruit a second chance. Yet almost a month passed and my medlars were as good as new. As in, they were still rock-hard. So I took them out and put them near a chilly window. And lo and behold, those little arses softened right up. (Although I think I picked mine a little less-ripe than they should have been.) Next up was cooking them, then letting them strain overnight, similar to making apple jelly. Once the liquid is left to strain overnight, you might take a look at the brownish liquid and think that you’ll made a mistake by listening to me. Even I thought there was something wrong. But as I cooked the vicious, murky liquid with some sugar, the final result was a few jars of quivering, shimmering, rosy-red jelly. I only got two-and-a-half jars from three pounds of fruit, though, so I doubt I’ll be giving these precious jars away this year. In which case, I’d better get my own derrière in gear and find more free fruit, and make more jelly. 4. The next day pour the liquid into a large pot – you should have about 1 quart (1l). Put a small plate in the freezer. 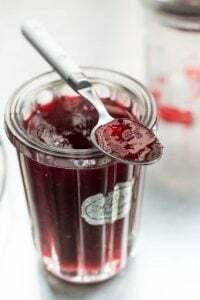 Add the sugar to the juice in the pot and cook the jelly until it reaches 220ºF (104ºC) or until it jells, which may happen a little before or after that temperature. 5. Ladle the jelly into clean jars. Notes: Some say you can save the medlar pulp and turn it into medlar and apple chutney. It’s rather messy and there are lots of little seeds in it to pluck out. But if you’re the industrious type, that’s an option. I added the apple because some say medlars don’t have enough pectin. I don’t use store-bought pectin in jam-making, but some people do. Next time I might add a quince instead. Medlars are kind of oddities and I’ve read a few diverse recipes, as noted. However it seems that the jelling qualities can vary, so you may also want to scan some of the recipes I linked to in the post, and below, because there are a few methods and you might want to adapt your own. For notes and methods on canning preserves, visit the USDA website. Such a beautiful color! What do they taste like? Medlar jelly sometimes doesn’t set- just label it Medlar Honey and pretend that’s what you intended to make all along! I love medlars, but I’m in the minority in our family. Never mind, I planted a tree anyway- 2 medlars this year! I think they taste like spiced apple. Megsy: They taste a bit similar to quince, but less intense. More perfumed and a bit “spiced” – they are related to the rose family. Hazel: I was interested in reading the variety of recipes and techniques at there (which is why I linked to so many of them) – and it seems that jelling sometimes is elusive. In France, there is a sugar that has a gelling agent (pectin) in it, that can be used, although the cooking time is only 5 minutes and I suspect that’s not enough time to develop the lovely crimson color. I’ve never seen fruit like this. The resulting jelly surely has a pretty color, unlike raw fruits themselves. If this fruit is from the rose family, there were probably a lot of thorns on the tree from which you were picking this fruit? I love foraging! I’ve come across a couple of fig trees here in Nantes, along with apple trees and walnuts, but my favourite is the fennel that grows in every bit of open ground here. Tons of pollen in spring and then seeds afterwards. Thanks a lot for introducing a new fruit to us. I never heard or saw this before.well its good to learn about it.thanks for the links too.they were informative. Freeze the little buggers then defrost them to hurry along the bletting. By the way, did you see any Blackthorns in the hedgerows on your travels? The dark purple/black fruit are Sloes as in gin, and jelly. It’s not been a good year for them here in the UK as the weather was awful in the spring and last year’s crop was superb (they seem to crop heavily in alternate years). How interesting! I’ve never heard of them and am now curious if they grow around here. The color of the jelly is exquisite! That looks beautiful. Nice with roast lamb, I expect? beautiful jelly jars! are they vintage? Yes, I found them at a flea market out in the countryside. I love them too! Beautiful photos, as usual. The color of the jam is exquisite. And this is a fruit I’ve never heard of. You teach me something new with almost every blog post. Thank you. OK, now is officially the time to raid my secret wild strawberry tree at the university, right behind the pre-med building. I was always dissappointed with their soggy sweet taste but i bet they’d make a perfect lemon-rind-laden jelly. Will try and report asap. Too bad i’m in mexico right now. I wonder if there are any wild fruit trees around here in San Cristobal. I’m sure I’ll never come across medlars, but the jelly you made from them looks beautiful. Love the tall jelly jars you used. Sounds similar to how the rowantree berries are treated. They are popular in the north of Russia for jellies, pastes and candies, but elsewhere they are left to the birds. In Hungary they are called naspolya and can be found in the markets, usually after the first frost. I have never seen them in the USA. Have you? There is a reference to them in “The Fruit Hunters,” a very interesting book by Adam Leith Gollner. Love the images. I’m very curious about how you plan to use the jelly. I thought the lamb idea sounded promising, or pairing with a strong cheese? I’m grasping for a way to imagine how it tastes. And we all wan the source on those jars…fantastique! The medlar jelly is beautiful! I wish I had more foraging options where I currently live. When we first moved here I was shocked that I couldn’t find wild blackberries in the obvious places. Pecans are abundant, and there are prickly pear cacti almost everywhere, but that’s about it. 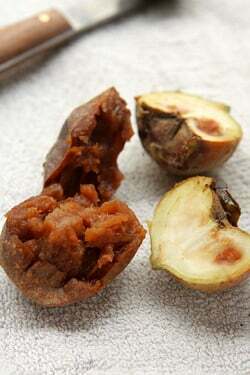 Do you know if I can find Medlar in the u.s? I’ve never seen them in the US although nurseries sell them, so it’s likely that there are some, somewhere. Try farmers markets, or use some of my tips in the link at the end of the post, if you want to hunt some down. Is medlar, in this case, a hawthorn fruit (crataegus azarolus) or loquat (eriobotrya japonica)? Freezing fruit (and berries) like these will create an interesting flavour, and is also, as said, necessary not to die the tanginess-death upon your first bite. I pick blackthorn berries (prunus spinosa) in the autumn and make jelly and a liquor for my husband. You need to pick them after first frost, preferably longer to take the edge off it. I do a double whammy, pick after first frost and toss them in the deep freeze for a few days. Maybe it’s double work with the flavour not changing much after the first frost but the husband is happy. I love hawthorn and you can find them wild in some places. Unfortunately (or how you want to look at it) climate here is too cold to allow loquat trees and variants of hawthorn to survive winter. have a bag of pineapple guavas on my table at the moment. never know quite what to do with them. think the same recipe would work? Pineapple guavas aren’t the same fruit so they likely wouldn’t work. I’ve never quite found a good use for pineapple guaves (I’m not all that fond of their very strong, assertively-sweet aroma and flavor) – the best use I’ve made of them in sautéeing them and serving them with fresh pineapple. Here’s a site that’s full of pineapple guave recipes! I wonder how hungry someone had to be figure out how to get nourishment out of so unpromising a fruit. Like rose hips, they’re probably a source of vitamin C.
Thank you for sharing this unique recipe. I’m going to see if I can find this cute fruit in Berlin. Marmalade-making is a very popular German hobby so maybe I can find them somewhere. It gets a little dull to keep making the standard peach, strawberry, and mixed berry jams. When looking to forage fruit (or find it on a market), checking out its natural growing zone can be helpful. My favourite berry of all time, arctic bramble (rubus arcticus), grows throughout zone 1 – 7 in Sweden, but is more likely to be found in zone 7. It’s the same with cloudberries that are found in zone 7 to 8 but not further south. 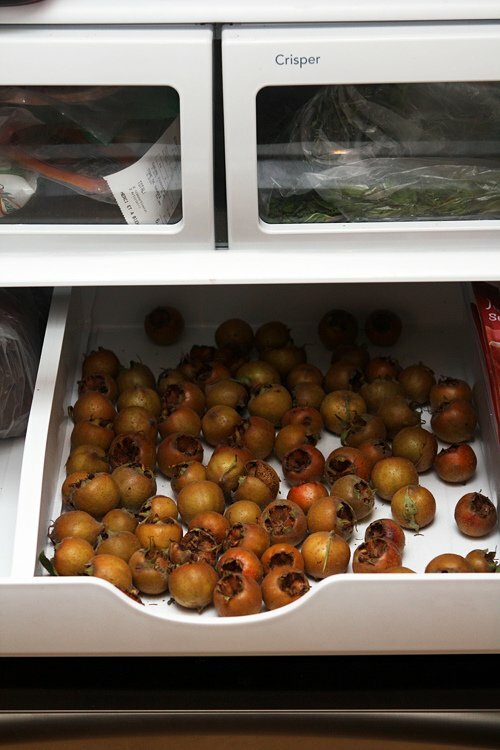 bletting medlars takes a week if you place them in a single layer in a baking dish or something similar, cover with a teatowel and place in a cool (such as pantry) dark place. In Australia, medlars are ready to blet in May, but the tree has the most beautiful autumn leaves and in spring, large white blossom, so the tree is great even if you don’t harvest the fruit. I have tried making jelly and it does turn out like honey but never thought to put an apple in as well, so thanks for the tip! seems like an awful lot of involvement for some jelly…. but as you said nothing free can stop you – and what made ME looking this up was the thought that it looked like quince jelly (also a tremendous effort to make but SO wonderful)…. I have lived in UK and heard about the medlars (and that they are very sour…) but I actually never knew anybody who make jam from it nor did I ever see it on sale anywhere – so BRAVO to you (once more!). 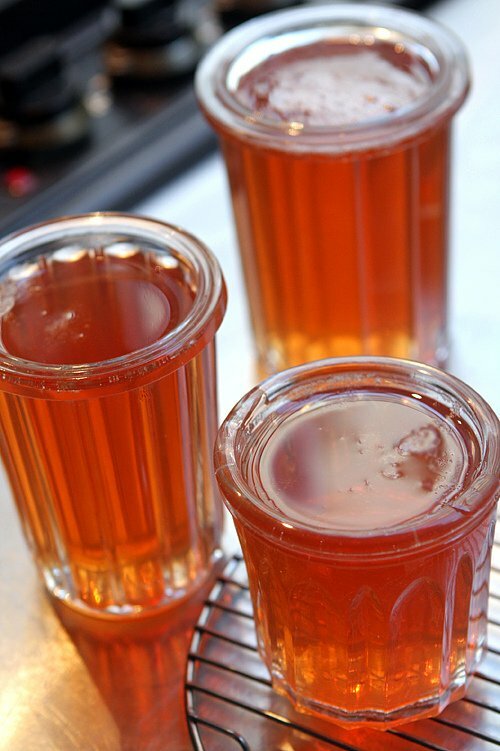 I – in the meantime – go to buy some quince jelly tomorrow, you just made my mouth water…. Auchan is selling the Grand-Maman brand and they do a nice one! Shall think of you when I eat my tartine from Friday onwards! Thank you David, you have taken me right back to my childhood in my grandmother’s kitchen. She used to make a really sweet ‘medlar’ jam, I had forgotten all about it. Always on a toasted tea-cake and the massive black range was alight – so winter! I am going to have to plant a tree now! @ Fran: Pineapple guavas are also called Feijoas. Here in NZ we love them, and almost everyone has a tree in their backyard. My mum makes amazing jelly with them -cooking the fruit a bit to get it all mushy, straining through muslin, then cooking with the sugar. It comes out a beautiful golden-amber colour. You can also make crumbles, cobblers or other delicious puddings with them. And my favourite is homemade icecream. 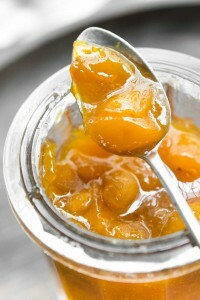 the next time someone leaves a bag of loquats on your porch make jelly with them! it is amazing. i made an upside down cake with them once, too. Those are some beautiful jars you got there. Works of art I say. Just gorgeous! We love hedgerow bounty here. I make Medlar Jam and also fruit leather and a type of Membrillo that is similar to Quince Membrillo. We have it with charcuterie, English Pork Pies and on top of Pate on toast. Medlar Jam/chutney suits quite defined spice and herb flavouring- we add Star Anise, a tiny grating of Nutmeg and sometimes shredded Stem Ginger. Think of it as a hedgerow version of Mostarda Di Cremona and very very good to eat with Winter meat dishes. The Medlar tree and fruit is often mentioned by Shakespeare, Chaucer and others. At one time, the Herb Garden at the Toledo Botanic Gardens included the Medlar as part of the Literature Bed. My father loved medlars. Our greengrocer in Colchester, Mr. Pilkington ripened them in his storeroom and put them on sale when they were ”just right”. The were bigger than the ones in your illustrations. The Church sisters of Marks Tey made jam from them together with apples so it was a medlar and apple jam flavoured with cloves. I overheard, as a big eared child, people from Tiptree telling my mum that the jam people there (in your list of related links) put potatoes in their jams but that it was very hush hush, this was also a very long time ago before there were lists of contents on containers. I never picked medlars from trees as there were always millions of flying insects around them – anyway that’s what I remember. Do you have clear plastic lids on the jelly jars and where did you get them? Thank You David, your blog is very informative and I really enjoy reading it. We love quince but the ones we get in our local grocery store in Midwest America are terrible. I didn’t know about bletting so if I ever get my hands on some organic quince I will know what to do! Lordy, I’m so easily won over by antique glassware and jars. The jelly is beautiful in them! I’m surprised you’re kinda down on loquats in this post – have you ever made a liqueur with the seeds? You dry them out, and then let them soak in some vodka or brandy for about 6 weeks, then strain and sweeten the booze with simple syrup. It’s like Amaretto, but slightly more complex. GOOD stuff. Sometimes I wind up just composting the fruit itself (or making shrub), but I will ALWAYS take the seeds off people’s hands! Hey David, I did your apple jelly recipe and thought that at 3/4cup sugar to 1 cup of juice was too much sugar and it set quite hard (I thought). So I found another recipe that said 1/2cup of sugar to 1 cup of juice and I didnt boil it for as long and got a softer jelly. Whats the ratio for Medlar Jelly, cant figure it out. I still added the Brandy. June Taylor in Berkeley CA preserves whole medlars in syrup, which she then sells only at her still room store. She wouldn’t tell me where she found them, either (I was curious – I’ve only read about them in Christine Ferber’s book, as well as Fearnley-Whittingstall’s River Cottage Preserves handbook). Wish I could find some here in California, but I suppose that’s a vain hope, just like my yearning for fresh black-and-red currants and elderberries. Your medlar jelly looks beautiful. Apparently this fruit is mentioned in a Shakespeare play – in a lewd context of course! By the way what is the real purpose of your bletting compartment in the frig? trisha: Yes, they were a bit stubborn to actually “gel” just in the end they did it. 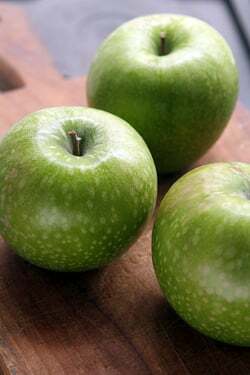 But I did link to a variety of recipes to show that there isn’t a ‘one size fits all’ for this curious fruits. Jessa + seth: I’ve always found loquats to be rather not-so-interesting and when I lived in California, anyone with a tree was always trying to find a use for them. Your recipes sound great! Thanks for the ideas. Sandy: She’s amazing and am surprised she uses medlars. She must know someone with a tree somewhere. Red currants are somewhat easy to come by (I used to get them at Monterey Market in Berkeley) but the black ones, and elderberries, are elusive. Bob: Quite a few folks in France use 1:1 of sugar to fruit for jam-making, although I use about one-quarter less sugar than that. 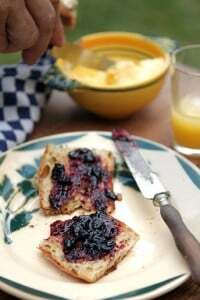 (Alsation jam-maker Christine Ferber uses about the same proportions that I do in her jams and jellies.) Fruit always varies depending on lots of factors, so glad you found a way to adapt to the particular fruits you were using. Sophie: I get them at flea markets, usually in the countryside. They don’t have lids and I suspect people used to seal them with paraffin? Kiki: It is kind of a lot of work for 2 jars of jelly, but interesting the Tiptree (who I linked to) makes a medlar jelly sold commercially. I wonder what it’s like? Tiptree products are very good including the medlar jam which is only seasonally available. Their Little Scarlet strawberry jam is wonderful too. My favourite is Myrttle jam. Thank you — will look for the lids in the us — my Mom used to seal her jelly jars with paraffin. Mayhaw, while sweet because of the sugar, has a nice sharp “bite” in its aftertaste. I have a picture I could not include of my last jar of Mayhaw and it too has the same deep orange, translucent look like your Medlar. Hi David, Your jelly looks very pretty. Very nice post. I love the way jelly/jam takes on pretty hues different to the fruit in its raw state. I reckon he trick with ripening hard & astringent fruit is time/warmth/ethylene. A brown paper bag with a ripish apple/banana/peach/ pear may assist the ripening of astringic/hard fruit. Works for me with kiwi fruit. Not so sure about light. Here in Japan the classic astringent fruit, Persimmon, in its myriad of varieties is often just left to ripen in its good time. Some varieties ripen firm and sweet (Amagaki – Sweet Persimmon), whereas the other type (Shibugaki – Astingent Persimmon) need to be left to get squishy and sweet or, peeled, hung on strings, and dried. Strange thing is some fruit is best turned into jam & jelly when slightly sour (eg. strawberries, citrus). I think it has something to do with the pectin (jelling agent) and citric acid for preservation & flavour. If jelling is a problem, a few lemon/orange/gfruit citrus peels do wonders. Leave the peels large and they are easy to fish-out at the end of cooking. I do this when making blueberry jam. I never need to use powdered jelling agents in my jam/jelly. I look at your lovely jelly and think a few rose petals in the jelly would also look very pretty. After cooking leave the jelly sit for 10 mins or so off the boil until starting to firm and artistically layer in petals as you put spoonfuls of jelly in the jar. Bit fiddly but, what the heck! what a beautiful jelly! i love finding ways to make neglected fruits delicious. i tried to make crab apple jelly this year, but didn’t add enough sugar and it was still much too tart (maybe they needed to be bletted!). maybe next year! Love this post! I’d never heard of medlar before and now want to see if I can find any in the US. Medlar and quince jam sounds like it would be wonderful. Also, your jam jars are beautiful. Are they vintage or is there any chance they can be purchased somewhere in Paris? Oh this brings back memories. When I lived in Paris, the father in the family I stayed with would go to the country on the weekend and make confiture de nefles… thanks for a trip down memory lane! Where did you find Elderflowers? And in this season? 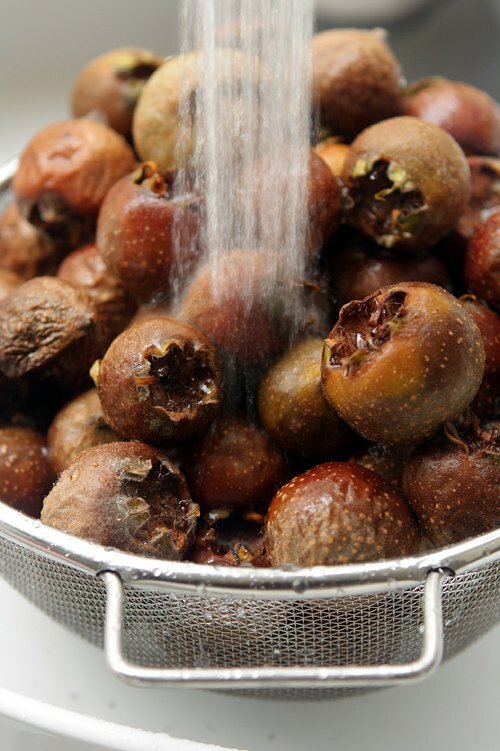 Great idea for using up the medlars in my parents backyard! My parents grew up eating them as is in northern Iran, but I never cared for their mushy texture! I can’t wait to try this jelly when they ripen. This reminds me of a unique jelly I made this summer from free fruit, the Chinese Date, which had a very different taste, sweet in a dry sort of way. The jelly was wonderful, didn’t set well, but worth the effort. I will have to look for Medlar. Quince is my favorite as it was with my grandmother. Have you tried this with sea-buckthorn? I WISH people were leaving loquats on my doorstep! My neighbors gave me some sometime (they’re all over Houston) and I made the most amazing jelly with it. And pie. Yum. 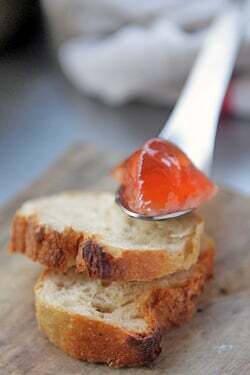 If you can’t find medlars but want to try the jelly, Wilkin and Sons make delicious medlar jelly (branded ‘Tiptree’). They do a whole range of old-fashioned preserves including rhubarb and mulberry. 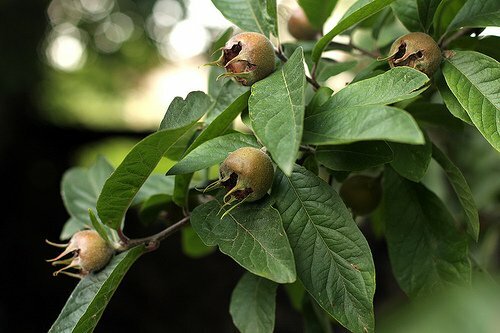 I didn’t know this kind of medlar as I am familiar with the mediterrenean ones (ripe in May-June and a plump orange shape). Please, where can I find those fruits in Paris? 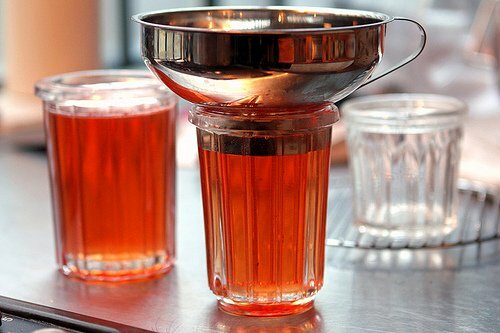 Or, buy this jelly (although I would love to do it myself according to your recipe)? Medlar is very popular in Georgia (country). We do not cook with them, just eat them in late Autumn early winter. I didn’t remove the seeds. I simply put everything in a strainer with cloth and let the juice drain out overnight. 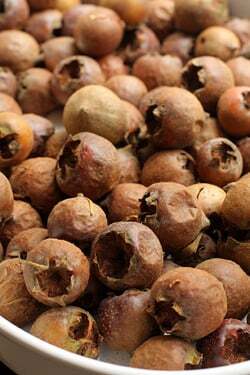 I have loved medlars for decades (my immigrant Italian grandparents had a tree), just didn’t know the name. If looking for medlars, I would try talking with older immigrants, many likely have a tree tucked away in a yard. I tried my first batch of jelly today – just waiting for it to set. I love these! I didn’t know what its called in English but it is a common fruit in Turkey too. I like them half rotten half ripe and I can eat the whole batch in one sitting. Thanks for reminder :-) I will try to find it here in USA. I’ve had two medlar treees for twenty years and finally did something with the cute fruit after bletting for 2 weeks. thanks for the easy to follow recipe!